This was not for the faint of heart. Don’t get me wrong, there are a lot of great things about the Aveda Institute, but it does require patience and an open mind. I got there at 6, but they mixed me up with another client and by 6:30 I still wasn’t with a stylist. I asked at the desk, they realized their mistake, and presented me with my stylist. She was very friendly with funky Rihanna-style hair. Like this. After about :30 seconds, it became apparent that she was a novice and an over-sharer. I learned that she’d been to styling school 3 times, but kept quitting before learning to cut. Red flag #1. She also told me that her funky hair was a result of a “relaxer incident”. Red flag #2. Apparently, her colleague over-relaxed her hair to the point that it all burned off. At this point, I started to get nervous. After my hair was washed, we went to work. The stylist meticulously divided my hair and put it up by sections, a la Scary spice. Then, took two sections and started to cut. I could tell she was scared, and trust me, she wasn’t alone! She cut a tiny bit in the back, and then wanted to ask the supervisor a question. When the supervisor arrived, she basically took over. I was thrilled, especially when the supe told me that my stylist didn’t know how to cut bangs yet. Say what?! 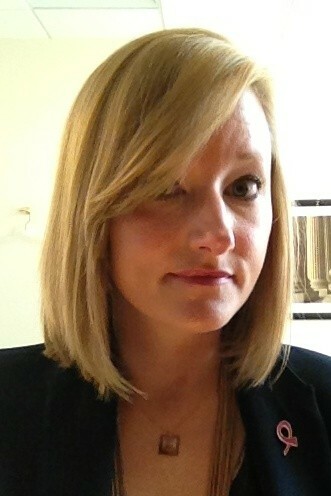 The supe gave me a great cut, and told me I looked like Heidi Klum. A bit far-fetched, but I’ll take it. The best news was my cheap haircut was 20% off because I had to wait – leaving my grand total at $18.40 INCLUDING tip at 25%. 1. You can request a 2nd year or “learning student” when you make your appointment. They are about to graduate and be released into the salon world. It’ll cost you a whopping $5 more, BUT they won’t put the fear of God into you. Bonus. 2. Only go if you have a simple hair cut in mind. If you want something drastic, I’d stick with someone more seasoned. 3. Give yourself plenty of time for the cut, i.e. don’t make dinner reservations immediately after. 4. They have other services! Scared of a haircut? Try a mani-pedi or a facial, a little bit easier and less permanent. In case you were curious, this was the final result. Not the best picture of me, but my hair looks good! I’m very disappointed by the lack of Rihanna-ness in your hair. I know – I told her that I didn’t need relaxer this visit. Maybe next time.